Roy Hargrove likes the Dakota Jazz Club. The Twin Cities jazz audience likes Roy Hargrove. The love affair keeps Roy coming back, sometimes twice within a given year. One of the most prolific composers, bandleaders and performers among modern jazz artists, Hargrove might also be one of the most musically giving.... whenever the trumpet is blowing, it’s blowing 110% from the heart, be it a ballad or blistering blues, a solo or full band assault. But it is not all about Roy on the bandstand—his sidemen get nearly equal time, sometimes more. And Roy brings on the most talented young artists around, risking losing them to their own careers as they gain national attention touring with Roy. Within a year, Hargrove released two distinctly different recordings with two of his three big projects—Earfood with his quintet (2008) and Emergence (2009) with his big band; both were on many “best of the year” lists, including mine. No doubt something new is in the works with his funky RH Factor ensemble. 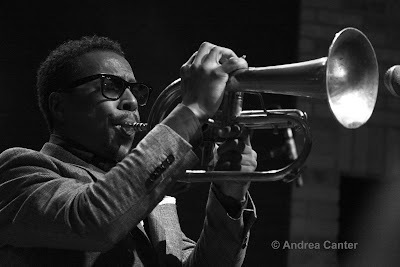 And within a year (June 2009 and January 2010), the Roy Hargrove Quintet twice blessed the Dakota stage with two nights of incendiary, joyous music. Each set seems to raise the bar a notch. And each visit shakes up the line-up a bit. Over the past two years we have enjoyed the revolving piano chair, the latest wunderkind Gerald Clayton, followed by the unfamiliar-should-be-well-known Sullivan Fortner, and now, the incredibly gifted Jonathan Batiste. Batiste is a presence even before he sits at the piano bench, tall and regally dressed with silver sparkle in his socks that matches his elegant scarf. And then there’s his hands—his fingers are as long as my feet (and I wear a 10! ), he seemingly spans 12 or more notes, giving block chords new definition. His boss Roy gave him plenty of playing space at the Dakota, and it was a triumph. Ameen Saleen was the “new kid” on bass, although at 30 he was hardly the youngest. He played throughout with a combined reverence and enthusiasm, taking full advantage of several solo opportunities to display his credentials. At 41, altoist Justin Robinson was the “old man” of the ensemble, Roy’s longest-standing collaborator in this band, and typically sharing equally on the front line and as soloist. Often the horns would come and go together, hanging behind the drums or even backstage while the young’uns turned the set into a trio romp. 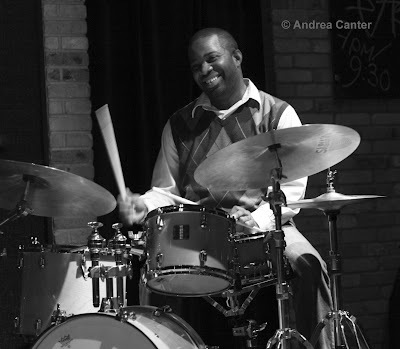 Speaking of “kids,” when watching drummer Montez Coleman, you can’t help but visualize a toddler on his mom’s kitchen floor, surrounded by every pot and pan, beating each in turn with a large spoon, evoking gleeful shouts and a big grin. Montez told me that, indeed, that was his first percussion workshop. “My mom would want to make dinner and I would have all her pots and pans!” The toddler’s big smile and exuberant antics still inform Coleman’s ferocious and multi-layered drumming. I heard three of the four sets this week. Hargrove was decked out in his fusion of fashion, brimmed hat, sunglasses, orange shirt, vested plaid suit, bow tie and... Minnesota winter boots. But there was nothing motley about his horn, swinging on a bluesy "Society Rag", a wide vibrato flugelhorn searing on a ballad, calling on saints with his signature closing “Bring It On Home to Me.” On night two, from the opening notes of the original “The Stinger,” the quintet roared through a blistering tour de force, Hargrove taking more solo time than on the previous night and thrilling the crowd by inviting local music legend Stokely Williams to add vocals to the encore. What could top this set? Maybe the closing 90-minutes, including Roy’s “Serenity of Solitude” and yet another surprise guest vocalist, this time Debbie Duncan. Roy doesn’t introduce most of his tunes, but it really doesn’t matter. Each composition, be it a jazz standard or brand new work, is played as if for the first and last time. Each moment is special. Food for the Gods and the ears. Jon Weber's "Show of Shows"